Success Stories from real companies. Straight From The Top Consulting has had several different campaigns. Almost all of our clients have been rewarded with top page results and every single client has received superb customer service as well as timely increases in page views. More page views doesn't always mean more sales, but we guarantee good quality views that result in end game purchases. Our SEO department specializes in making our clients' sites marketing machines, no matter what their industry or specialization. From ecommerce to real estate, we've worked with a wide spectrum of websites found success in every corner. We don't mean to brag...well, okay, maybe we mean to just a little. Naturally you want proof, for that read further. Our Search Engine Optimization clients make up a wide range of industries, products, and services. However, they all have the same goals - to market themselves effectively on the Internet. We are able to place our clients with enviable Search Engine rankings and significantly increase the traffic to their Web sites. 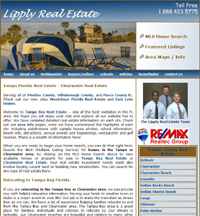 Lipply Real Estate approached us in 2003 with a blank canvas and an idea. They wanted to be the online leader in Tampa Real Estate. They needed the full gauntlet of services as they had no internet presence. The entire Real Estate industry was on fire and they were way behind. The competition in Tampa Bay was impressive but they were no match for our online marketing strategies. We went to work and within 3 months they closed their first sale generated solely from the website. Oh, and it just so happened to be a $900,000 beach house, which generated over $20,000 in commission. Having our client achieve a sizeable Return On Investment with our services in a few months is our highest focus. We look to achieve ROI for you as soon as possible so you can keep re-investing and growing your business. Lipply Real Estate is now the #1 producer in Real Estate at the #1 office in the state of Florida. Park Avenue Pavers had limited start up capital. They needed to take it slow. We suggested that they get a website and do Pay Per Click Advertising, once that system generated enough to expand we would take the next step. We immediately got their website up and running and positioned it with paid advertising. Within the first few weeks they sold a $135,000 paver job. It wasn't long before they came back to us for further development after they saw the results in a few short weeks. With no exposure to natural search and rising competition Park Avenue Pavers decided to get ahead of the pack. They had plans to expand their business into other areas as well as open a retail facility. They needed more customers to feed the machine. Natural search placement was the next logical step. They also decided to add a industry leading online quote tool for paver installations. 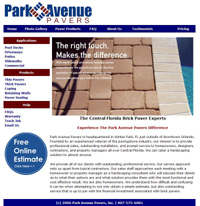 After deploying our marketing techniques the Park Avenue Paver website was highly ranked on all the major search engines in 4 months. With this new exposure we increased their website traffic and sales by 300%! 300yards.com already had a website selling golf components and paid advertising in place as was doing quite well. Their conversion rate (% of visitors that made a purchase) was low for the industry however due to their weak website structure. In addition to that they wished to expand their presence in natural search to capitalize on the 70% of internet customers they were missing out on. First we improved the navigational structure of their site to properly funnel customers to buying points and then process transactions. Then we implemented an analytic tracking system to track the visitors every move. After the first implementation we made 2 revisions to optimize the strength of their site and ultimately DOUBLED their Conversion rate. Once the structure of the website was in place we could begin work on the marketing side with Search Engine Optimization. Off-page marketing had already started but the on-page had to wait until the site layout and content was complete. The SEO work for this project took a little longer to produce results due to the very high level of competition of the search terms in which they wanted to be ranked for. All tolled it took 6 months to complete this project. We DOUBLED the traffic levels that they were receiving. Double the traffic + Double the Conversion Rate = 4 Times MORE Business! Starting a new business in a competitive industry is very tough like MAT Tampa. Fitness Tek found us with pretty low rankings, and have seen almost immediate results. Now they have several top 10 rankings and their results climb every month thanks to our SEO Maintenance Package. Falcon Living is a small family Chicago real estate brokerage. The managers came to us to increase their reputation through the social media outlets on the internet. A secondary objective was also to find online outlets to market their listings. The first goal was achieved through creative copywriting and promotion of social media profile pages throughout the different channels in real estate and other Chicago, Illinois online social outlets. The second goal for real estate listings was achieved through database integration and RSS feed creation for syndication in many popular online syndication based classifieds such as Google, Zillow, Trulia, etc. Final result: Falcon Living is one of the most recognized independent brokerages in Chicagoland. The number of leads generated for their listings have also multiplied giving us another established client.